Can we talk seriously about interactive whiteboards in the special education classroom? I have a big love-hate relationship with them. I soooo love their potential. But I am so tired of seeing them used as giant TVs. So often they aren’t used as interactive tools. Instead, they just play YouTube videos. Videos are, by their nature, usually NOT interactive. Can you tell this has been bothering me for a while? I know how much everyone pines for an interactive whiteboard. It is, after all, the 21st century and it certainly does seem like we should be moving toward using technology throughout the day. But just showing a video on a whiteboard isn’t advancing us to the future. It’s bringing back the past with a bigger screen. That’s not to say you can’t use it to show videos and that some videos are useful. They are great for showing video modeling. But then we stop and have the student follow the model--not just watch it passively. Let’s face it, most of our students are not passive learners. Well, except for those video game and cartoon phrases you hear repeatedly, right? But just watching a video in morning meeting of a song is not teaching them a concept. So, today I’m talking about the Dos and Don’ts of interactive whiteboards in the special education classroom. It’s based on what I often see when walking into classrooms and ways you can use them effectively with your students. Trust me, there are a whole lot of ways we can use them and they are dynamite tools to have in our arsenal. And they have even more potential because our students are often so drawn to watch the screen. The key is to make it a learning activity, not just watching. The whole point of the technology is for it to be interactive. Passively watching a bunch of videos that no one expects you to engage with is not interactive. 2. Don’t use interactive activities above the level of most students. I see this happen most frequently with morning meeting and calendar time. Only one student in the classroom might know the calendar well enough to put the right day and date in the right place so that student operates the whiteboard each day. And the rest of the students watch but don’t really learn how to do it for themselves or even what it means. 3. Don’t lose time cueing your programs up. Instead, put this task into your zoning plan so the whiteboard is ready to go when your students get there. Remember that downtime is not your friend, and when students have to wait for you to get the software running, it’s downtime for them. 4. Don’t use programs only the teacher controls. I see this one frequently when the whiteboard is used in situations like preschool classes. If only the teacher is interacting with it, the interactivity is not really benefiting the student. 5. Don’t use the whiteboard just to fill time. Make sure that your plans for your interactive whiteboard activities align with the goals for the students. Integrate them into your lesson plans. Don’t just use them as time keepers or presentations. 1. Do use manipulatives to augment interaction with the students. The fact is that not every student can interact with the whiteboard at the same time. And our students typically do best when they have something tangible to engage with during the activity. So, even though you are using the whiteboard, have actual manipulatives, like visuals for songs or books, for the students to use. 2. Do make videos of your own for video modeling. Video modeling is an evidence-based practice. 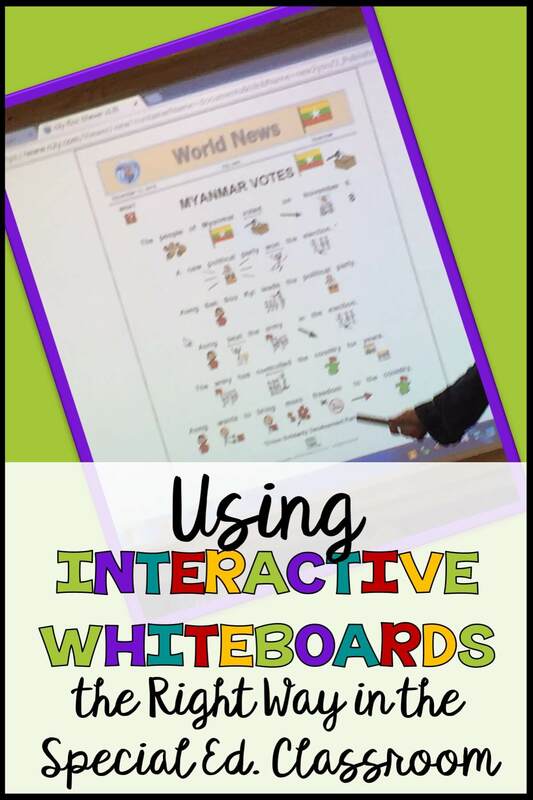 Interactive whiteboards can be a great way to present the video model to the whole class or just to one or a small group of students. Let them watch it multiple times, rewind it and use it as they want. If you have a tablet hooked up to the whiteboard, you might consider giving a student access to it to control the video. You can get tips on how to use video modeling here. 3. Do use it for interactive programs the students use. For instance, if you use Unique Learning System, present the lesson on the whiteboard. If you use Teachtown, use it with the white board. Use it to demonstrate lessons. Use it to present the model of the art project. 4. Do have multiple students interact with the board. Interactive whiteboards are tough because only one person can touch them at a time. So, in a group activity, plan out multiple “helper” opportunities for student to interact with it. Set it up so that each student answers questions on it, makes choices on it, and / or writes on it to interact with it in some way. 5. Do use it to present group lessons in limited quantities. They are great for brain breaks for 5 minutes or so of exercise and movement. But use it sparingly this way or it becomes just like a TV. And if you do that, consider having students make choices on the board by touching a picture or word. This makes it more interactive than passive. Presenting the Unique social studies or science lesson and then having the students follow with the activity for comprehension. Use books from Tarheel Reader to have students take turns reading from the projector. Not all of those examples are interactive, but they do serve an interactive purpose within the classroom. I know there must be lots of great ideas out there about how to use them effectively for instruction. Share them in the comments!! Looking for visuals to supplement Your Whiteboard? Click the images below to check them out in my store! « He Can’t Always Get What He Wants! 1. During class meeting there is a slide of the American flag. My SLP put buttons on their AAC’s so my non-verbal kids can touch the buttons and we all say the first line of the Pledge of Allegiance. 2. On the monthly calendar, students drag the correct number to the next box. I adapt this for each student so they can do it independently, choose from a field of two numbers, be shown the correct number but have to drag it to a space I am pointing to, or match the number I indicate by touching the same number on their iPad screen. 3. We have a slide that says, “Hey Joe, what’s for lunch today?” which the verbal students read. Then a non-verbal student, who has found all the foods on their talker prior to that time, touches the answer and ‘reads’ the menu for the day. 4. Students drag the weather symbol for the day into the box. 5. Students take turns touching the dice to spin and show a new sight word. Even if they can’t read the word, they participate by spinning the dice. They have learned to spin a dice that does not already show a word. Some kids can spin the dice and then match the letters and spell the word on their iPad and then ‘say’ the word. 6. I read the Unique story for the month while displaying it on the Smartboard. Then we do the comprehension questions together. Even the students who do not understand the story can learn to come up when their name is called and follow the direction to ‘touch’ where I point, give a high-five, and follow the instruction to ‘sit’. 7. Sometimes just having a student get out of their seat and come up and touch something on the board gives them an opportunity to respond to their name, get up and move, have success, and follow one-step directions. 8. My students have all learned to recognize their name in print (with color-coded prompting for some), find their name, and drag it into a box to indicate they are at school that day. 9. There is a link to a YouTube video of our “Good Morning Song” that a student can touch each day when we sing. 10. I also use it for individual instruction for completing/building patterns, identifying rhyming words, identifying big/little, soring pictures by initial consonant sound, working on place value with base-10 blocks the student moves/counts, etc. Though I’ve made some of my own and adapted many, there are lots of lessons that are already made and ready to go on Smartexchange.